All items paid for will be shipped in time for Christmas except MHWF clothing, which is special ordered. 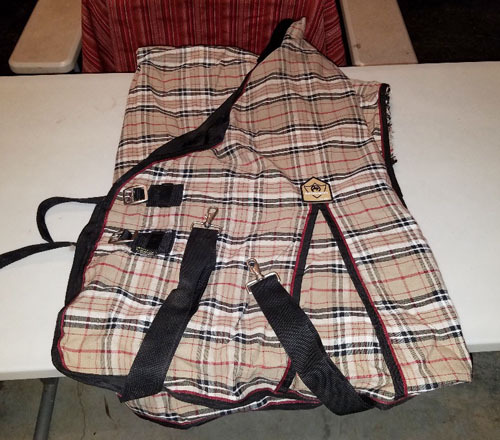 To bid, simply send an email to scott@equineadoption.com with the item number you are bidding on, the amount of your bid (rounded to the nearest dollar) and your full name and mailing address. When we receive your bid, we will update the auction page and send you an email to confirm your bid was received. Please make sure to include the item number, your bid and your full name and mailing address with all bids! You purchased an item.....now what? Once the auction is over you will receive an email confirming that you were the high bidder on an item or items, along with the total of your bids. There are two ways you can pay for your item(s). The preferred method of payment for your winning bids is through any of the PayPal links on our website. All you need is a credit or debit card or a PayPal account. Just click one of the PayPal banners on our website, enter your info and the amount you wish to send. Your payment will automatically show up in the MHWF account and we will reply with an email to let you know it was received. Auction item payments must be received within 7 days of the end of auction. "Buy It Now" items require immediate payment via PayPal. 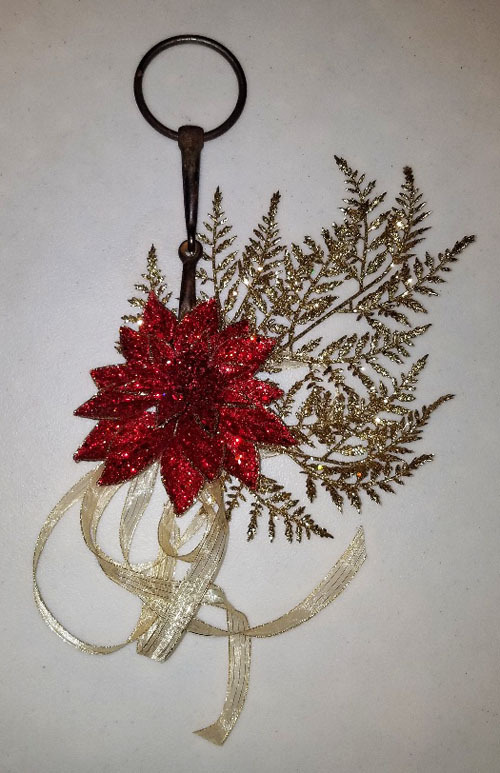 Please include the item number as well as your full name and mailing address with all auction bids! Please make sure to hit reload or refresh for the most current version of this page. Bids must be a minimum of $2.00 increments. Time to order your 2019 MHWF calendars. An annual must to show your support at home or in the office. 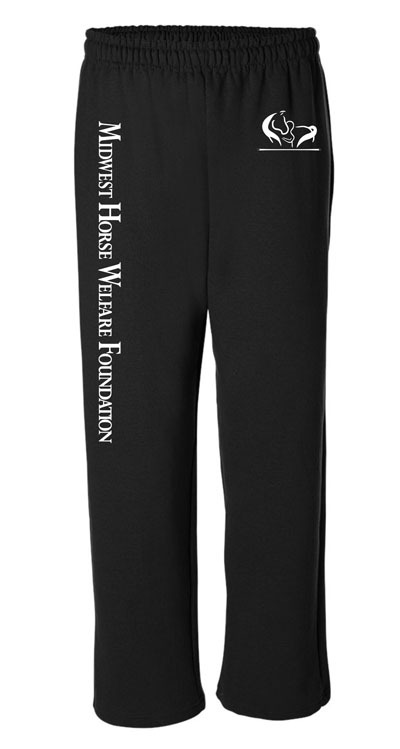 These also make great gifts, while supporting horses in need. Each calendar features a full color photo cover with a clear protective sheet and each month features a new, full page, full color photo, taken by Karen of MHWF. Special dates and MHWF events added to each month as well. Calendars will ship to you in time for Christmas! 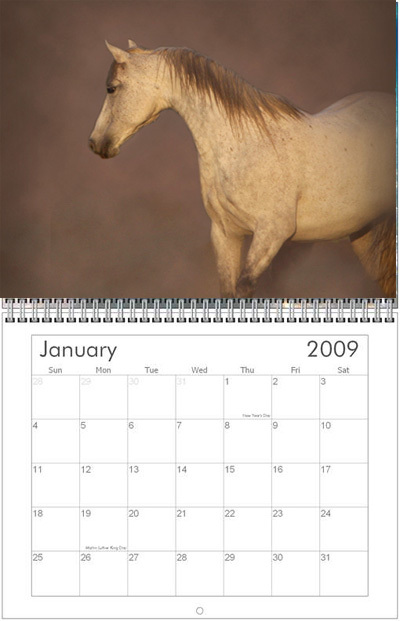 ATTN: The photo to the right is not the actual calendar and is an example image only. Made by Distric, these shirts have a winning style that is soft and comfortable, made from 4.5-ounce 60/40 ring spun combed cotton/poly blend. 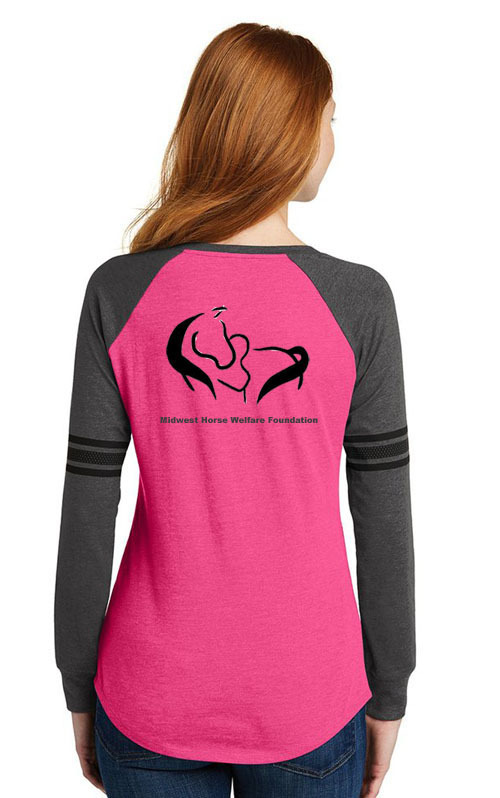 These new MHWF shirts feature a small silkscreened logo on the front left shoulder and our normal large silkscreened logo on the back. These look even better in person! The photo to the right is not the actual artwork and was done using Photoshop to be used as an example. This item must be purchased through the "Buy it now" button. 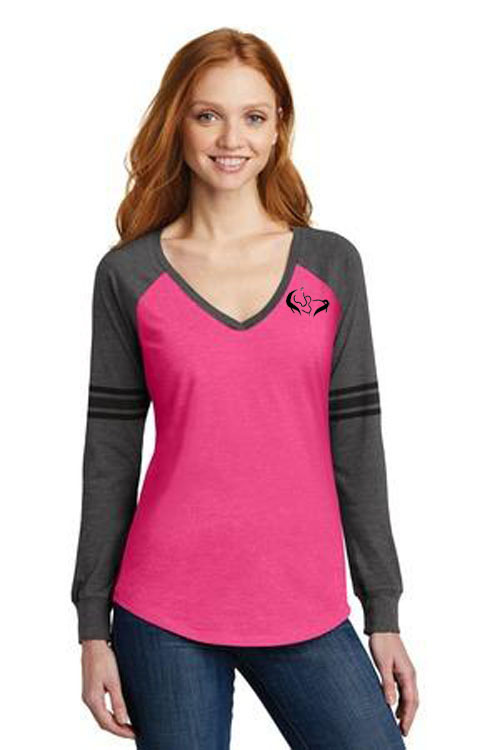 MHWF clothing is custom ordered (size and color) for each person who orders. Please allow 4 to 6 weeks for delivery. Lightweight and extra soft, this tee is perfect. 4.5-ounce, 50/25/25 poly/ring spun combed cotton/rayon blend. 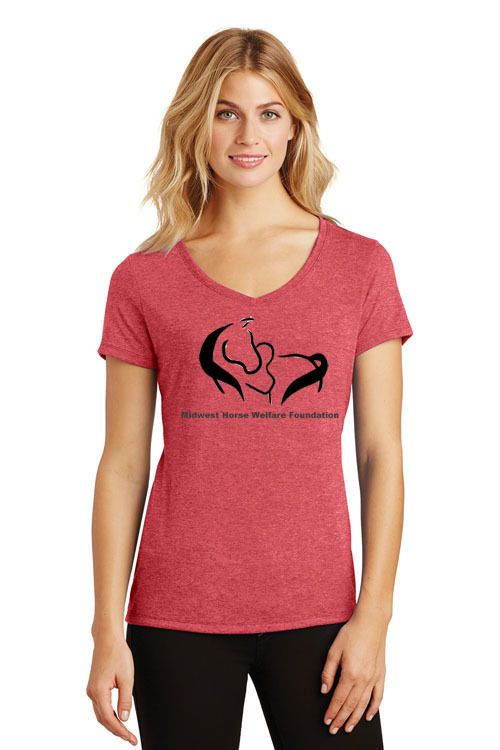 These shirts feature a large silkscreened MHWF logo on the back. Super comfortable and light. 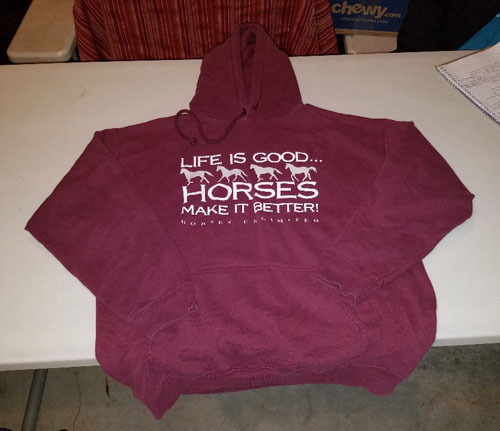 Gilden Heavy 50/50 blend hoodies, well made, durable. 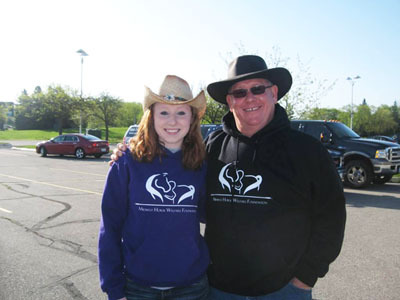 Show your support for horses in need! 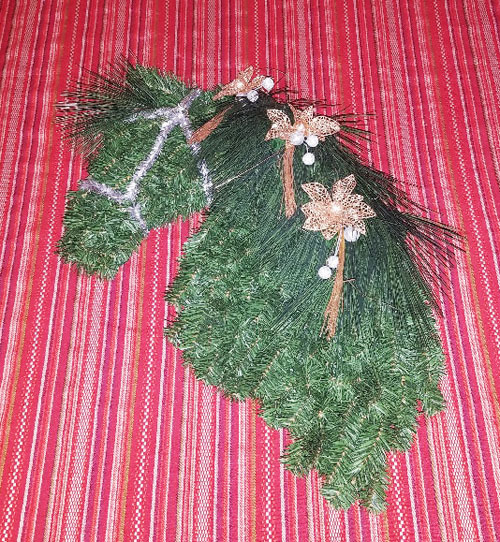 Give a gift to your loved one and give back to the MHWF horses at the same time. Send your friend, co-worker, or family member an MHWF Gift Certificate. You name the amount of your gift and MHWF will send it to them for you. 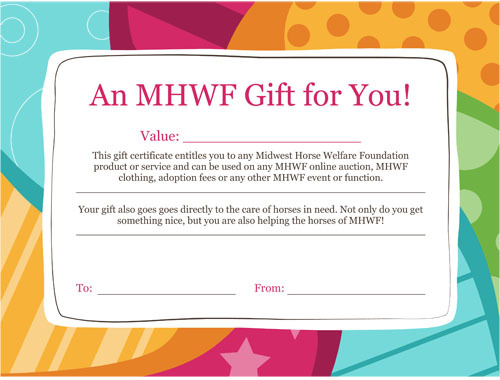 These gift certificates can be used on any MHWF online auction, MHWF clothing, adoption fees or any other MHWF event or function. 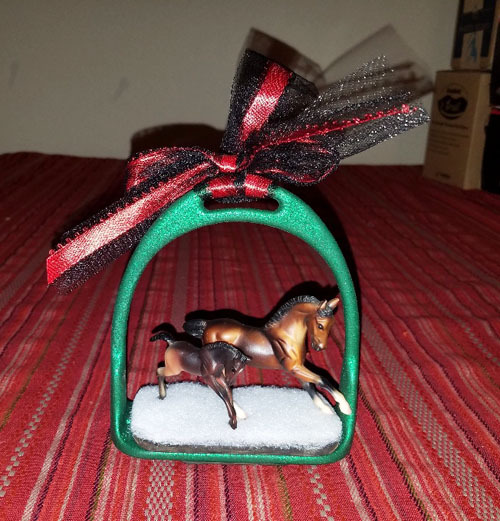 The perfect gift for any horse lover or MHWF supporter. Let them decide how to spend it. 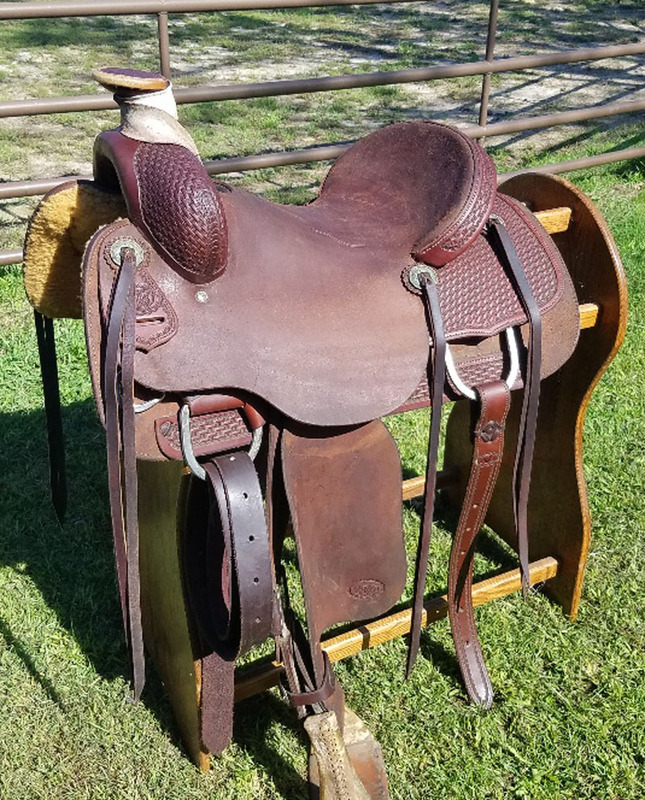 While we do not have this saddle listed here on this auction, MHWF does have this superior quality NRS saddle for sale. For detailed description and photos, please click on the link below. 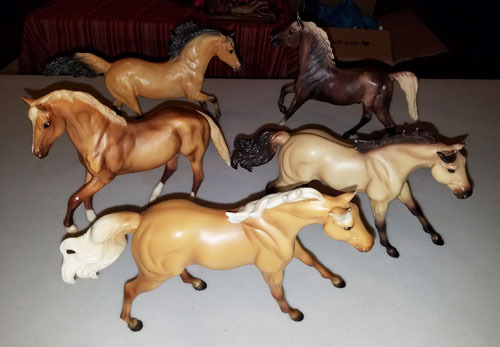 This professional trade show display was purchased for MHWF about 10 years ago and we used it for several years at the Midwest Horse Fair and a few other MHWF events. It was also used as a backdrop for some pet and family portraits. 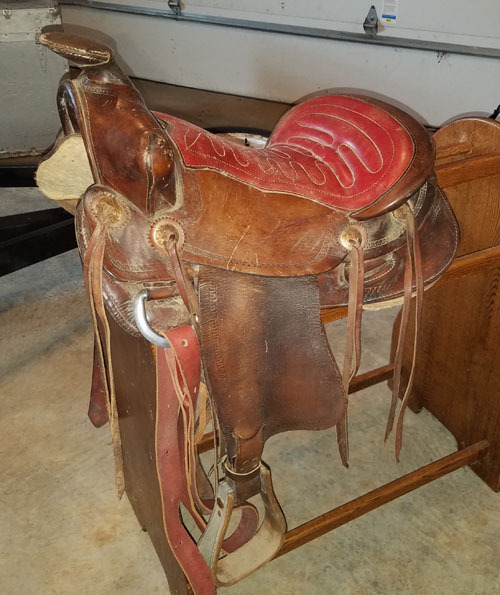 While it is not brand new anymore, it is complete and in very good shape. 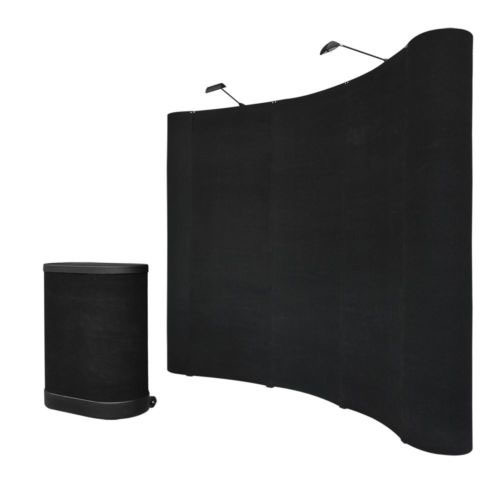 This display was over $2500.00 new. 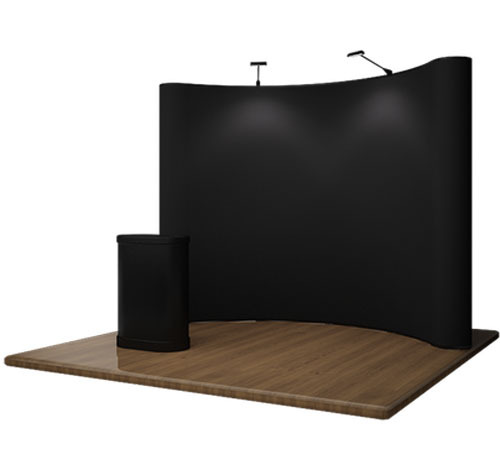 Included is the collapsible aluminum backdrop frame, the heavy duty black felt and poly backed panels, the rounded end pieces, two heavy duty lights, and the super heavy duty rolling case, which can also be used as a a podium or stand for a TV. Nothing on this display is made cheaply and nothing is torn, stained, missing or broken. Set up in a couple of minutes and tears down even faster and folds up into it's own rolling case. 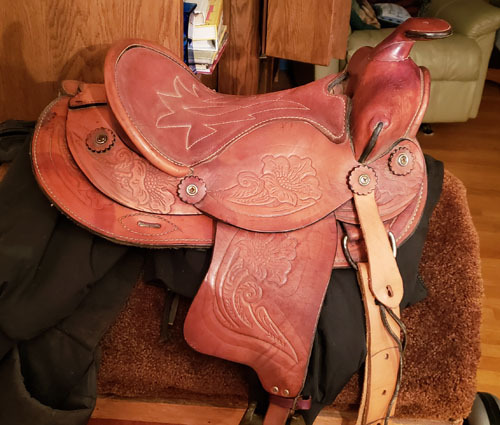 15 inch Western saddle. 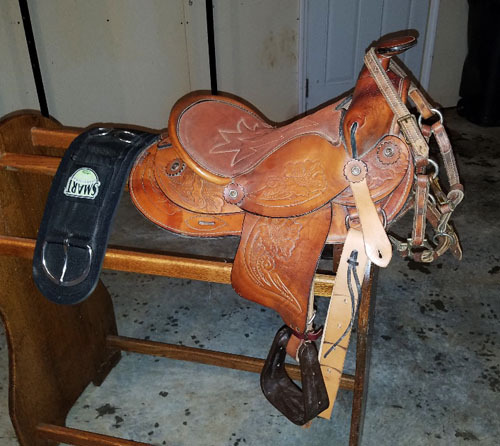 While this saddle won't win any beauty contests, it is a quality saddle in really good condition. There are no tears, rips, torn out stitches and there is no dry rotted leather. 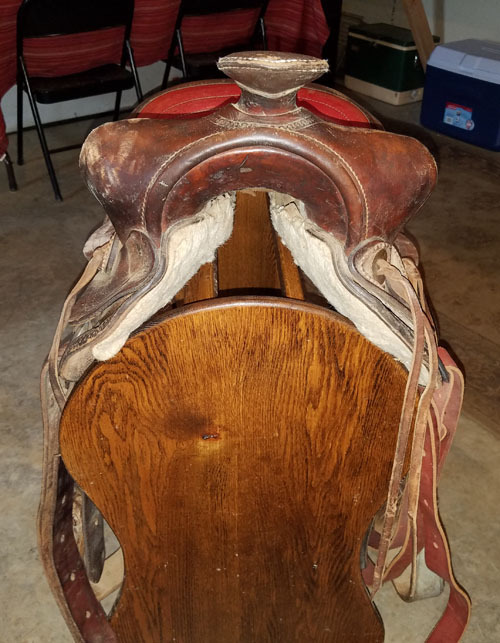 This is an old saddle, made very well, built to last for many, many years. Fleece is in very good shape, tree is solid. 6 inch gullet. 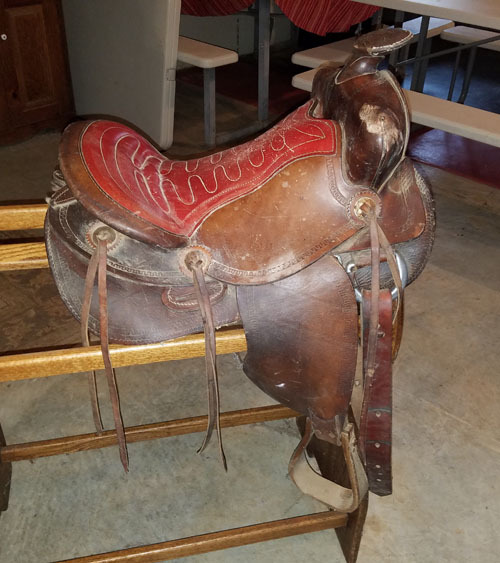 This saddle can be picked up at MHWF or can be shipped to anywhere in WI for a flat $25.00. Please include the item number, your full name, and mailing address with all bids! Cavello's top of the line boot. These currently sell for $150.00 for a pair. These boots do not look to us to have ever been used. 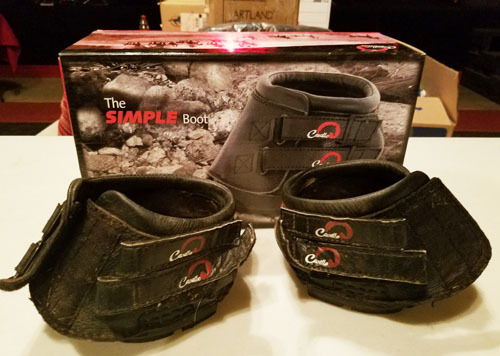 Cavallo Simple Boots are multi-purpose hoof boots that are excellent for all-terrain hoof protection for the barefoot horse. 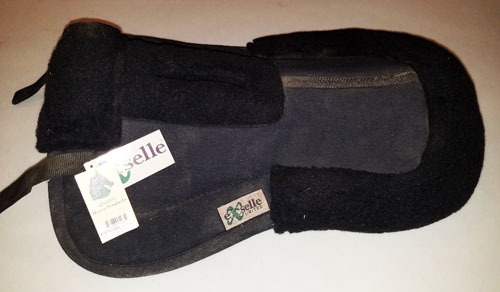 Allows natural expansion of the hoof wall as well as increased blood circulation. 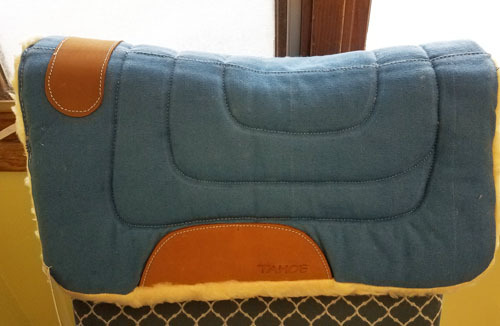 Absorbs shock so your horse's legs don't need to! 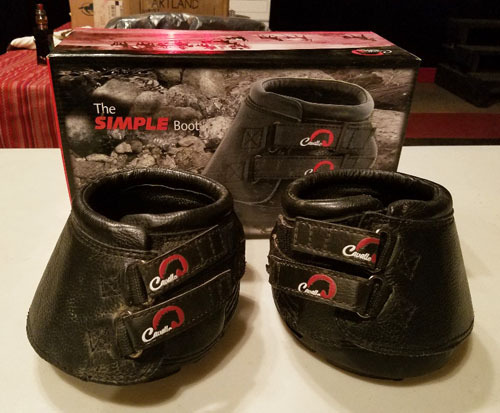 Also provides comfort for chronic pain, hoof sensitivity and helps with rehabilitation from injuries, abscesses, navicular disease, laminitis/founder, punctures, sole bruising and contracted heels. 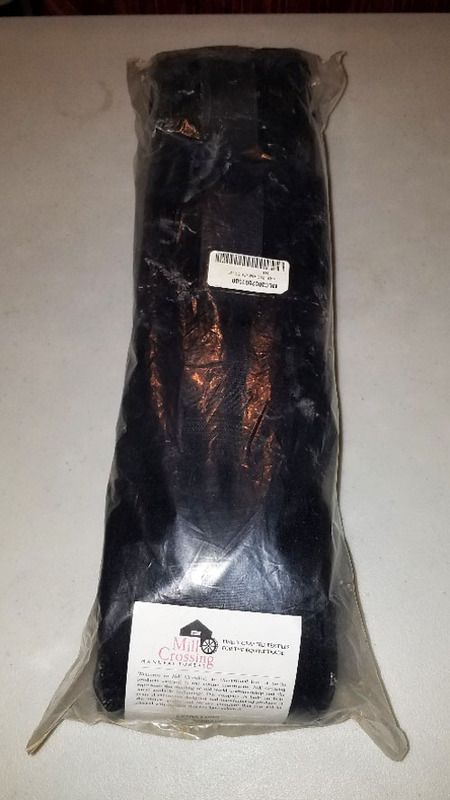 Adds protection during trailering and breeding and works great as a "spare tire" when a shoe is lost. 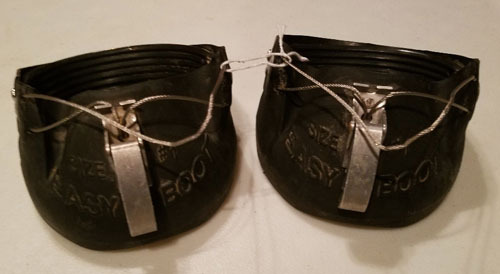 Lightweight, simple to put on and remove, and stays securely on the hoof. Shaped for the natural hoof (needs no inserts or shims). 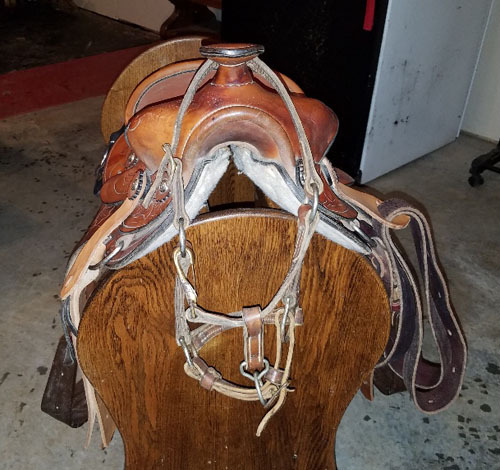 This all leather 12' pony saddle is in excellent condition and comes with a brand new 24" Smart Cinch and a used leather pony halter. It has a 12 inch seat and a 4.5 inch gullet. These currently sell for $100.00 for a pair. 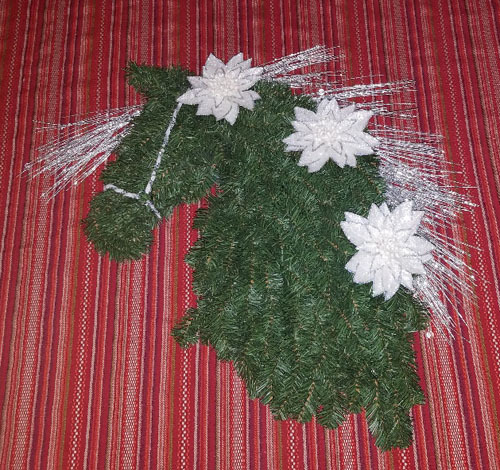 This horse head wreath was made by an MHWF adopter and supporter and is well made and even more beautiful in person. It measures 28" tall and features gold bows tied into the mane. This is big, beautiful and made to last for years and years. Reproduction of an original alcohol ink painting by Denise Johnson of Artfulearth.com. Large format 13" x 19" Fits a standard size frame. Shipped rolled in a tube. Denise of Artfulearth.com is a long time MHWF supporter, going all the way back to our very beginning. She is also a very talented artist who sells her work all over the US at art shows. 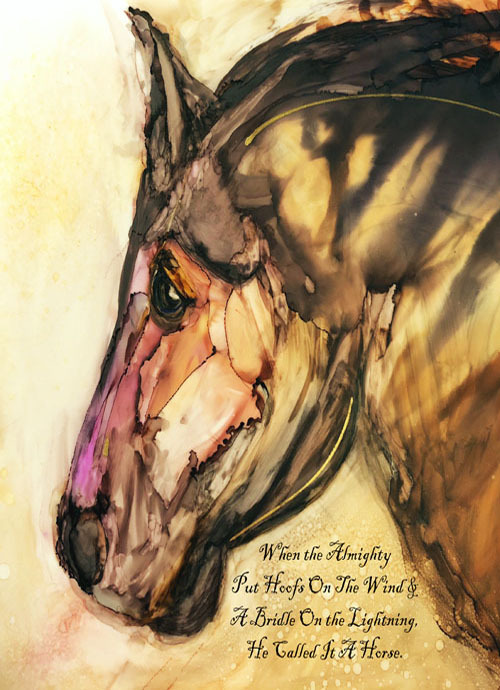 Get this beautiful print and help a horse in need. Makes a great Christmas gift too! 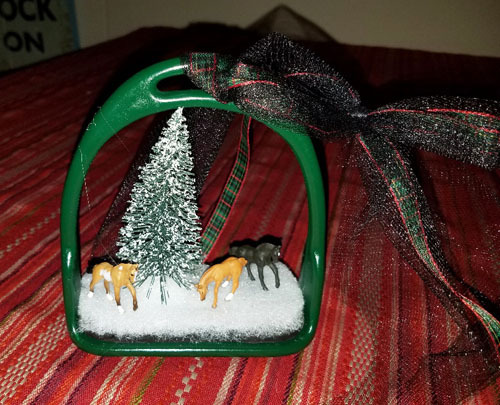 Made by an MHWF adopter and supporter, this beautiful piece is made from a real iron snaffle bit and would make a great decorative hanger or an even better gift. 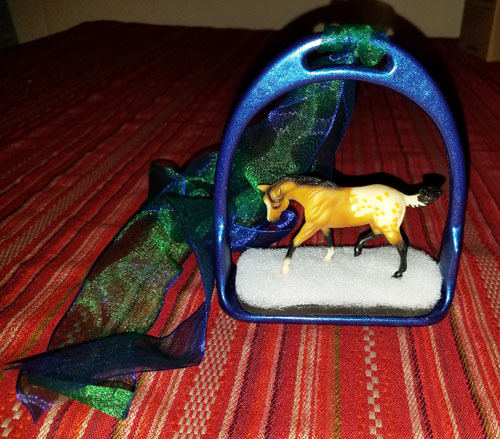 Made by an MHWF adopter and supporter, this beautiful piece is made from a real iron stirrup and would make a great decorative hanger or an even better gift. 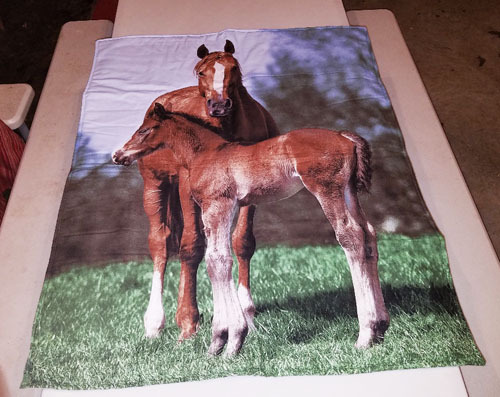 Hand made by an MHWF adopter and supporter, this double sided fleece blanket measures 50" x 74". This is an extra large blanket and it takes a lot of time to tie all the knots so beautifully. These blankets are super warm and last for years and years. Both Karen and Scott of MHWF have had blankets like these for almost 10 years and still use them every day.....really durable and warm. Made by an MHWF supporter, this beautiful quilted wall hanging measures 33" x 40" and has loops sewn into the back to add a rod for display. Even more beautiful in person. 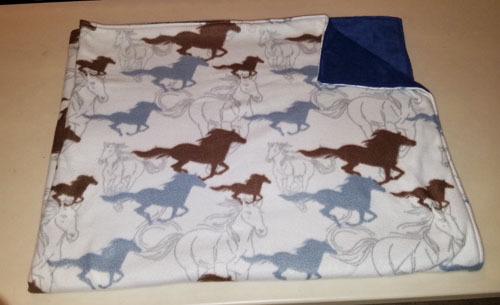 Hand made by an MHWF adopter and supporter, this double sided fleece blanket measures 45" x 50". These blankets are super warm and last for years and years. 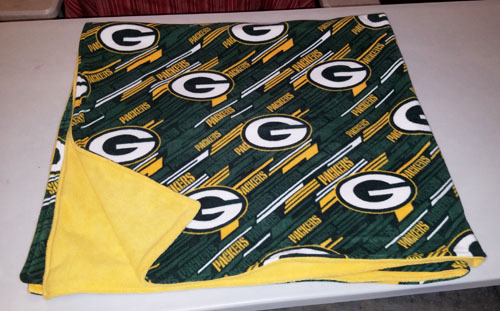 Both Karen and Scott of MHWF have had blankets like these for almost 10 years and still use them every day.....really durable and warm. 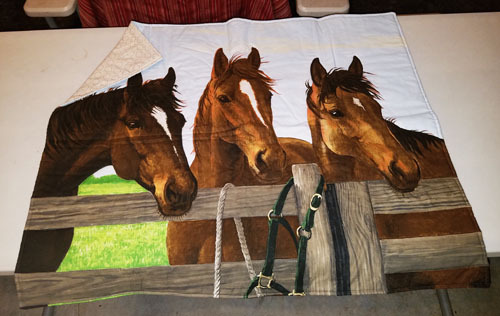 Hand made by an MHWF adopter and supporter, this double sided fleece blanket measures 56" x 64". These blankets are super warm and last for years and years. 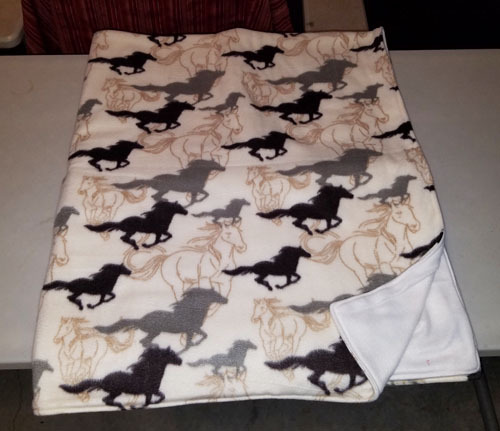 Both Karen and Scott of MHWF have had blankets like these for almost 10 years and still use them every day.....really durable and warm. 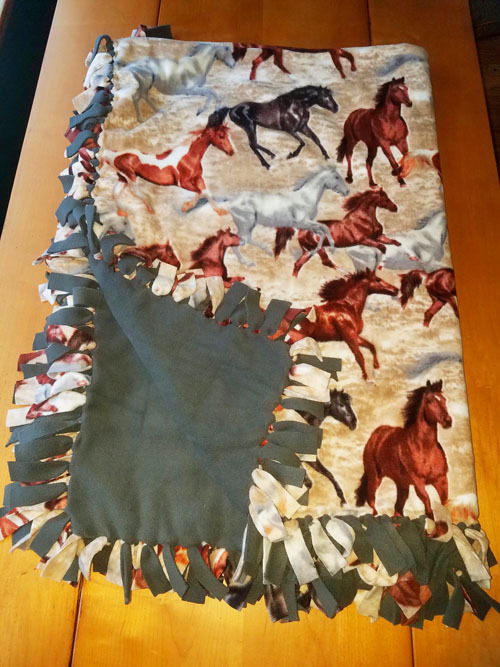 Hand made by an MHWF adopter and supporter, this double sided fleece blanket measures 46" x 60". These blankets are super warm and last for years and years. 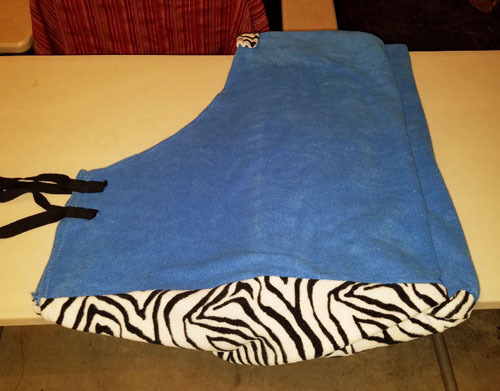 Both Karen and Scott of MHWF have had blankets like these for almost 10 years and still use them every day.....really durable and warm. 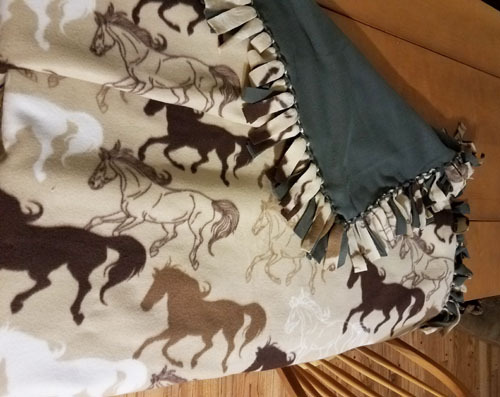 Hand made by an MHWF adopter and supporter, this fleece horse cooler blanket is new and is equivalent to a 85" horse blanket, so it was made for a big horse. These are nice, durable and flashy. 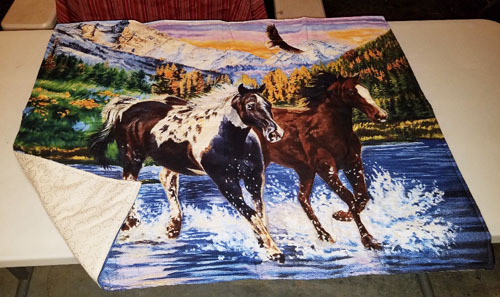 Brand new fleece throw featuring a beautiful horse scene. 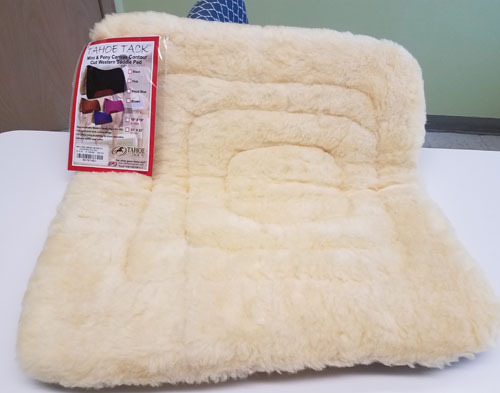 The fleece throw measures 50" x 60". 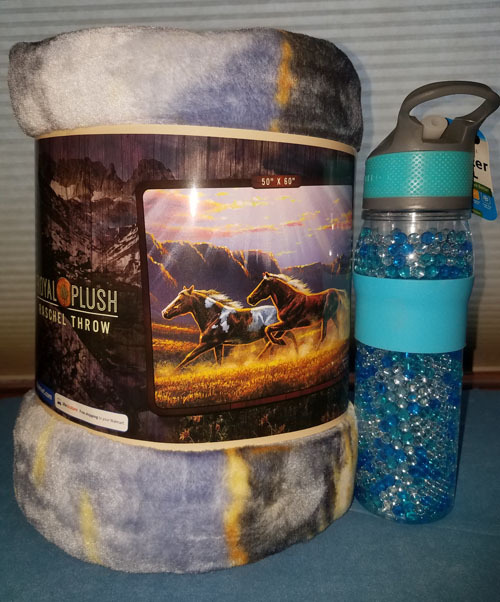 Also included is a brand new hot/cold beverage bottle so the high bidder can really enjoy time in front of the TV or fire without getting up to constantly refill a mug. Brand new fleece throw featuring cute puppies. 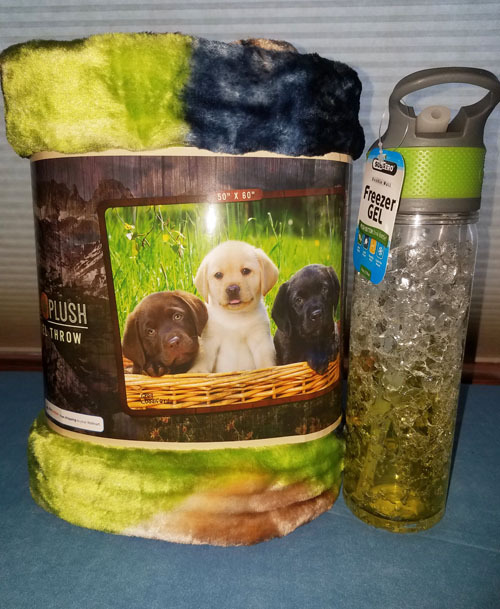 The fleece throw measures 50" x 60". 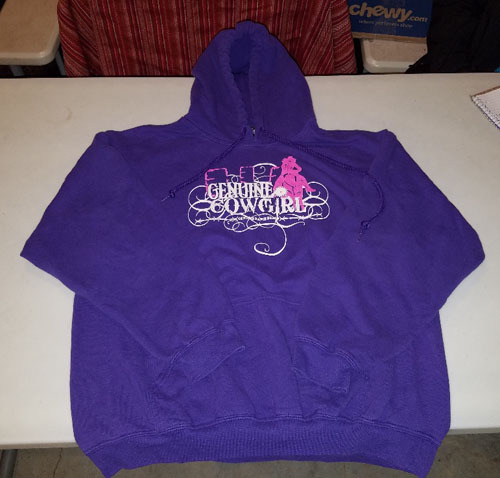 Tow new or like new horse themed hoodies, both size large and in perfect condition, clean and new. 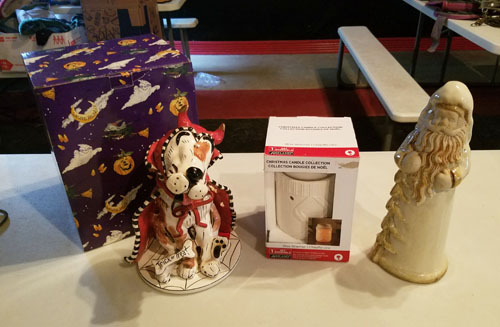 Included is a large "Devil Dog" Great Dane tea light, brand new, 10 inches tall, a brand new cylindrical tea light scented wax melt warmer. The tea light softens the scented melt to make the fragrance. Also included is a12 inch tall ceramic Santa. 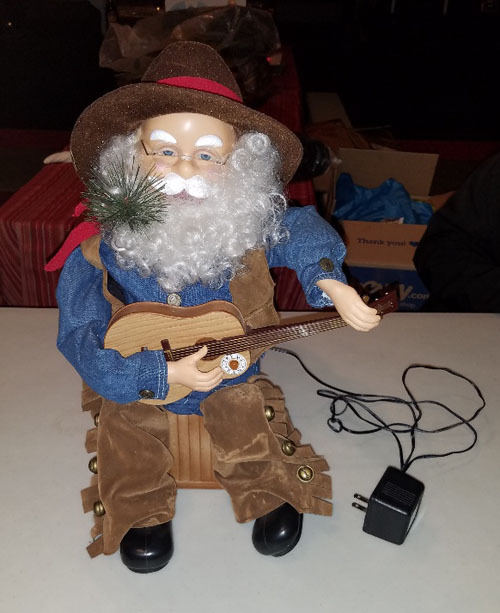 Also included is the singing/guitar playing cowboy Santa, shown in the lower photo. Sandy can sing you a variety of songs and is either new or like new, in perfect working order. Santa is 18" tall. 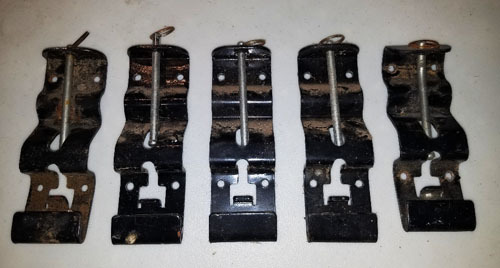 5 high quality steel bucket hangers made to attach to your stall wall. These have a little dust on them, but are indestructible and in excellent shape. 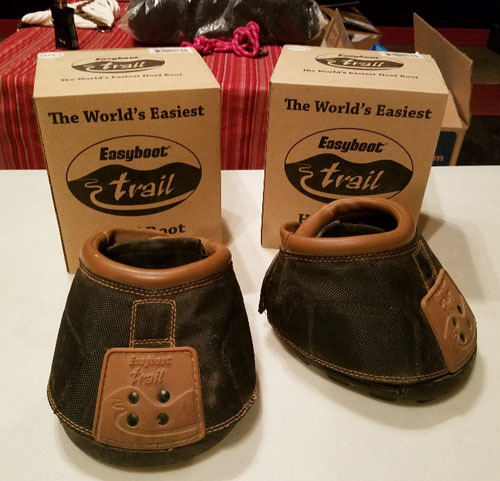 One pair of used easy boots, size 2 in very good condition. These normally sell for $116.00 per pair. One pair of used easy boots, size 1 in very good condition. These normally sell for $116.00 per pair. 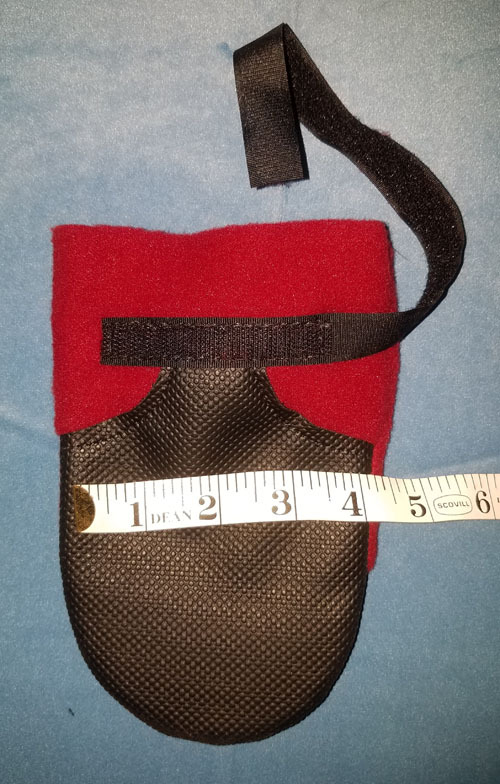 Half Pad Fleece with Rolled Edge and wither cutout. Billet straps to help hold it in place. 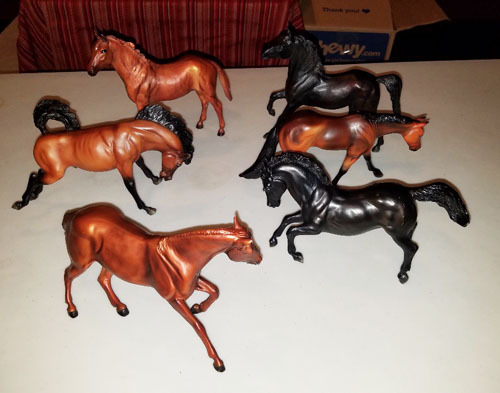 Width = in center 15 1/2"
Width = at widest part under the cantle 15"
5 model horses....Breyers? All are in perfect shape, no dust, dirt or broken ears/legs. 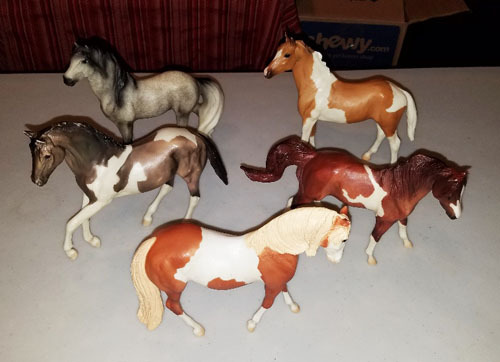 6 model horses....Breyers? All are in perfect shape, no dust, dirt or broken ears/legs. 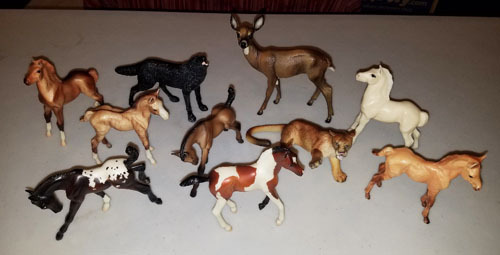 7 model foals, one black wolf, one deer and one mountain lion....Breyers? All are in perfect shape, no dust, dirt or broken ears/legs. The box is a little bent up, but the pet pen inside is brand new and unopened. 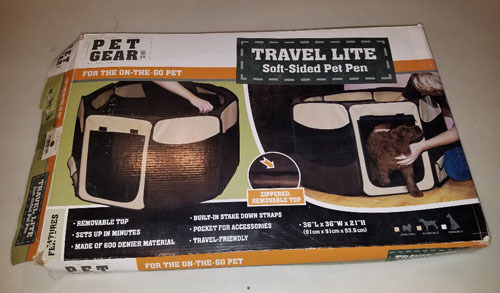 This easily folds up for easy storage and travel and unfolds into a large play pen for your pet that measures 36 inch across and 21 inches tall. 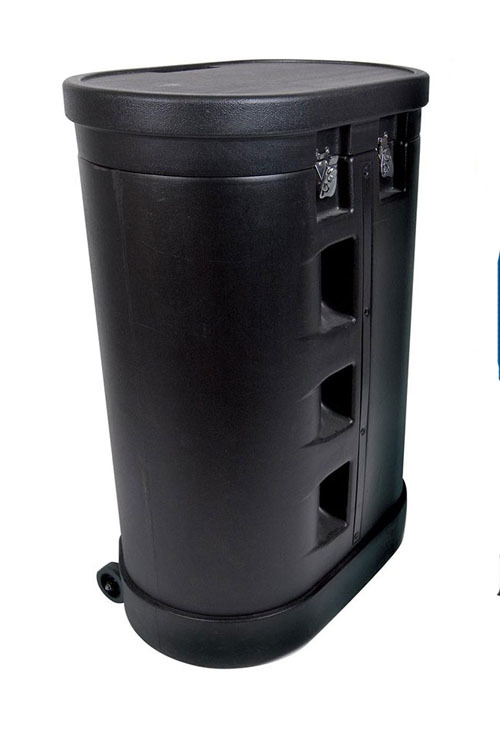 Super heavy duty with removable top. These are great for taking along camping or visiting family and friends. We have one just like this one and love it. 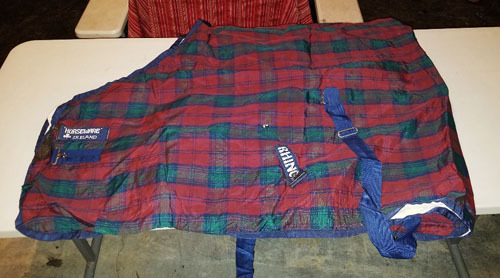 Like new, 69" Kensington non-insulated stable blanket in new or like new condition. All straps are there, no rips, tears, or missing stitching. Clean and complete. 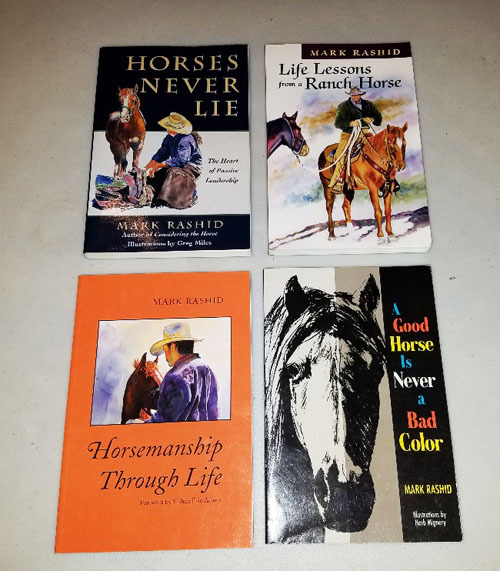 Mark Rashid is one of the most loved and respected clinicians/writers in the business and these are some of his most classic books.....must reads. If you have never read " A Good Horse is Never a Bad Color" you are truly missing out. Mark's way of teaching in the form of story telling is unique and entertaining as well as informative. 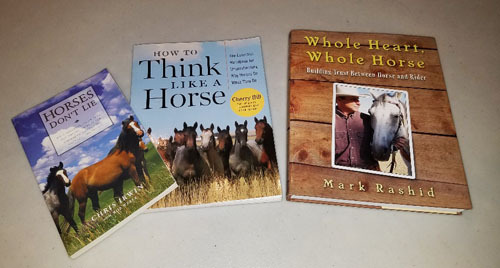 Three horse related books such as "Whole Heart - Whole Horse" by Mark Rashid, "How to Think Like a Horse" and "Horses Don't Lie" by Chris Irwin. 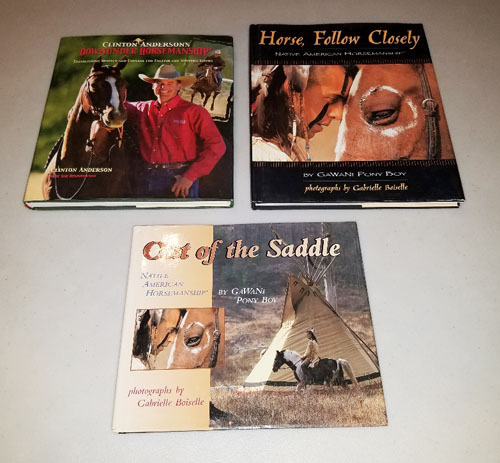 Three hard cover horse related books such as "Down Under Horsemanship" by Clinton Anderson, "Horse, Follow Closely" by Gawani Pony Boy, and "Out of the Saddle" also by Gawani Pony Boy. 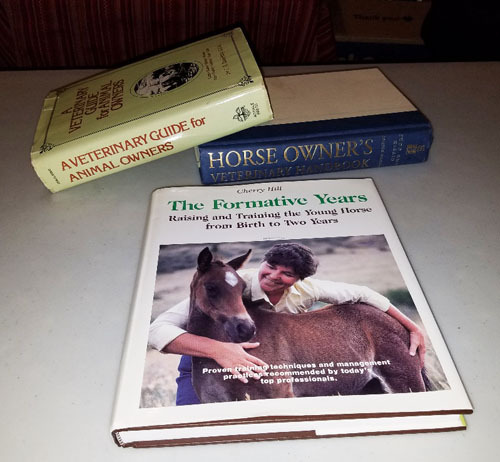 Three hard cover horse related books such as "A Veterinary Guide for Animal Owners", "Horse Owner's Veterinary Handbook" and "The Formative Years: Raising and Training the Young Horse from Birth to Two Years". 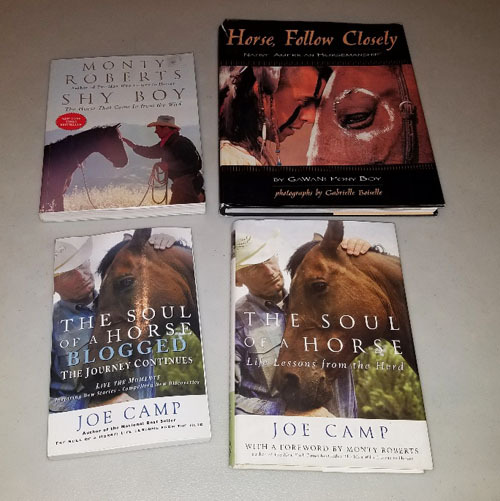 Four horse related books such as "Shy Boy" by Monty Roberts, "Horse, Follow Closely" by Gawanai Pony Boy, "The Soul of a Horse" and The Soul of a Horse - Blogged: The Journey Continues" by Joe Camp. 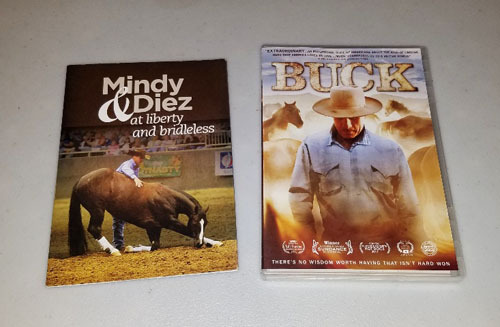 Two horse related DVDs. "Mindy & Diez at Liberty and Bridleless" and "Buck". Two brand new western cinches. 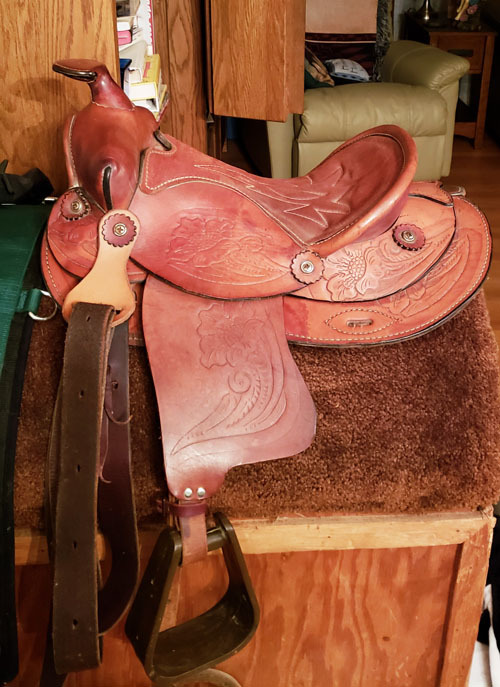 The cinch in the top photo is think padded felt and is a 33". The cotton rope cinch in the bottom photo is 32". 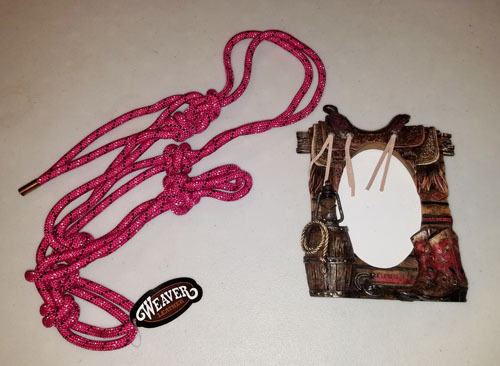 Brand new Weaver rope halter and poly western themed photo frame for a 5 x 7 photo. 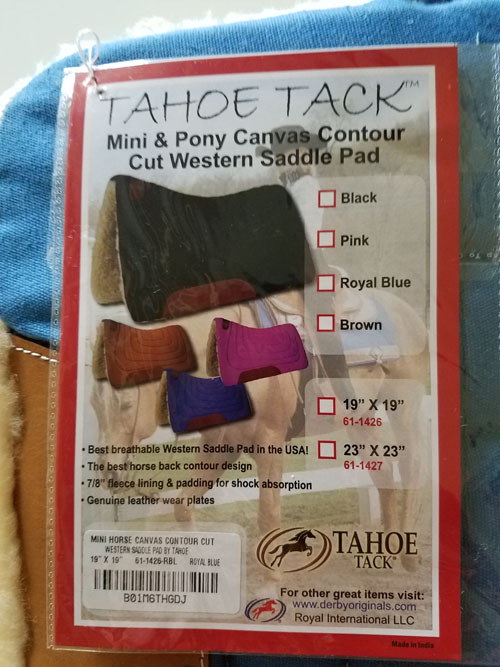 This think felt wither pad has a little dust on it, but looks to be new and unused....perfect for a little extra for those high withered horses. 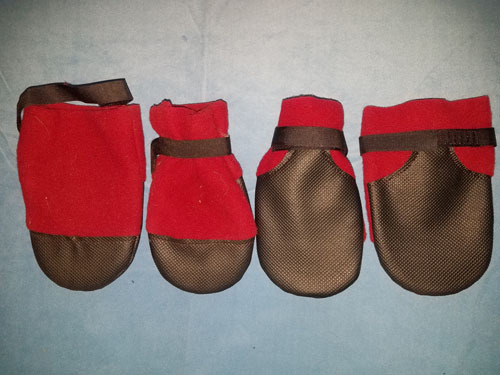 Set of 4 heavy duty dog boots to help protect your dog's paws in the snow and salt. 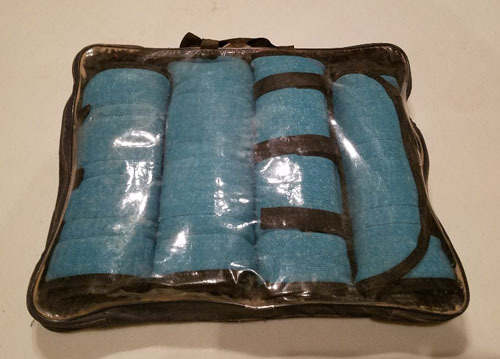 Two full sets (8 wraps) of teal horse leg wraps and one brand new set of black fleece polo wraps.